Governor Charlie Baker spoke at the State House about new proposals to battle the opioid epidemic. Governor Charlie Baker proposed Tuesday a sweeping package intended to boost the state’s battle against opioid addiction, including an effort to ensure higher-quality addiction treatment and a new provision allowing doctors to commit unwilling patients to 72 hours in a treatment facility. Noting that the state has added 1,100 treatment beds since 2015, Baker said it is now time to address some of the gaps, particularly in the care provided after detoxification. 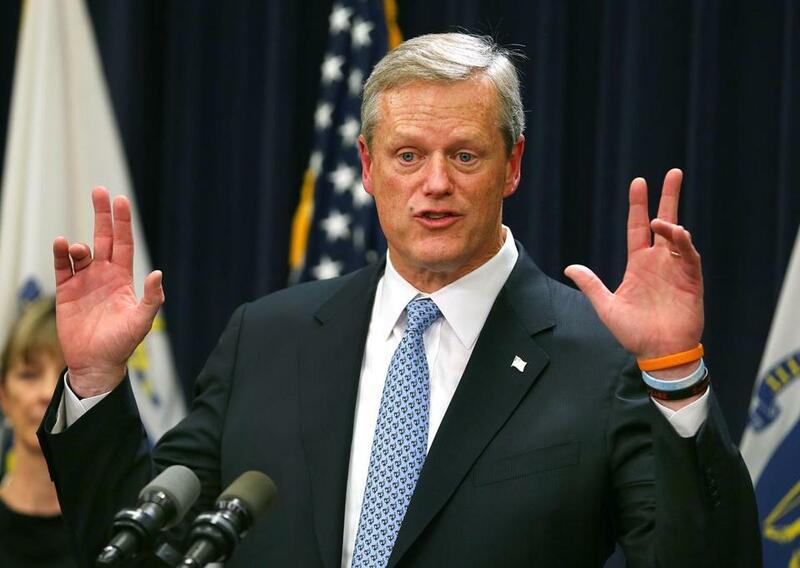 “If your fundamental problem is a substance use problem, we should be providing you with access to treatment that actually makes sense and will work for you,” Baker said at a State House press conference. The treatment provided after inpatient detoxification is not credentialed or monitored, he said. “We would never accept that in cancer or heart disease or congestive heart failure or other types of chronic illness,” he said. The plan involves an annual outlay of $30 million in Medicaid funding for opioid treatment and proposes a $2 million trust fund for education. Tuesday’s proposals represent Baker’s second major legislative effort targeting the opioid crisis since he took office promising to make it a top priority. At an emotional ceremony in March 2016, he signed a bill that curtailed access to prescribed opioids, among other provisions. The state reported this week that some 1,470 people died of opioid overdoses from January through September, down by 10 percent from the same period last year. “We want to see a lot more progress,” Baker said Tuesday. His proposed legislation would direct the Department of Public Health to set licensure requirements for treatment facilities that ensure they can provide appropriate treatment. For example, providers would be required to demonstrate the ability to treat mental illnesses as well as addiction and would be barred from discriminating against people covered by Medicaid. The bill also would establish two commissions to identify the qualifications of clinicians and establish credentials for recovery coaches — people who are in recovery from addiction and help others in that struggle. The goal is to make it easier for patients and their relatives to navigate the system. Marylou Sudders, secretary of health and human services, said that patients often get nothing more than a list of names when they seek treatment for addiction. The proposed commission would develop a way to provide information about the specific skills of each provider. Additionally, setting up a credentialing system for recovery coaches could lead to insurance reimbursement for those services. In addition to the legislation, the package includes administrative actions to expand prevention efforts in schools and a plan to ask the federal government for flexibility, including allowing the over-the-counter sale of the overdose-reversing medication naloxone. Baker’s proposed legislation also focuses on emergency departments, where thousands of patients suffering from addiction show up after an overdose. Clinicians would be required to directly connect willing patients to treatment, rather than merely handing them a list of phone numbers to call. And for those who are not willing, starting in 2020, the bill would permit doctors to send addicted patients deemed a danger to themselves or others for 72 hours of involuntary treatment at an inpatient facility. Two years ago, Baker stirred controversy with proposal to hold addicted patients for 72 hours against their will in emergency departments. That idea was rejected by the Legislature. The new bill takes a different approach to the 72-hour hold, enabling doctors to transfer patients with addiction to a treatment facility, much as they would with a person deemed a danger because of mental illness. Michael Botticelli, executive director of Boston Medical Center’s Grayken Center for Addiction, praised the governor’s package, saying it addresses the major components of the problem today. “It again positions Massachusetts as a significant leader,” he said. He was particularly pleased with plans help identify effective treatment programs and the emergency room provisions. “What it acknowledges is that we need to try to engage people in treatment at various intervention points,” said Botticelli, a former director of substance abuse services in Massachusetts and former “drug czar” in the Obama administration. Kurt A. Isaacson, president of Spectrum Health Systems, a large addiction-treatment provider, wrote in an e-mail that “the breadth of the proposal is stunning and would have a real impact on the opioid epidemic.” Increasing the number of residential beds will be key, he said — but very difficult at current payment rates. ■ Convening a working group to strengthen education programs in the schools aimed at preventing drug abuse. ■ Expanding a training program for school nurses in screening for substance use problems. ■ Using Medicaid funding to expand residential recovery services, increase access to medication-assisted treatment, add recovery coaches, and create a method for determining patients’ medical needs.